Gideon John Davies (born 1964) FRS FRSC FMedSci is a Professor of Chemistry in the York Structural Biology Laboratory (YSBL) at the University of York, in the UK. Davies was educated at the University of Bristol where he was awarded a Bachelor of Science degree in Biochemistry and a PhD in 1990 for research on the enzyme phosphoglycerate kinase isolated from the bacterium Bacillus stearothermophilus, and supervised by Herman Watson and Len Hall. Following his PhD, Davies did postdoctoral research at the European Molecular Biology Laboratory (EMBL) outstation in Hamburg working with Keith S. Wilson on the use of synchrotron radiation in protein crystallography and also and the Centre national de la recherche scientifique (CNRS) in Grenoble. in 1990 Davies moved to York to work with Dale Wigley and Guy Dodson on DNA gyrase. He was appointed Professor at the University of York in 2001. He has collaborated with Alywn Jones, Bernard Henrissat, Steve Withers and David Vocadlo. Davies research investigates the biological chemistry of carbohydrates, from their structure to their roles in enzymology, glycobiology, use as biofuels and implications for microbiota. His research has been funded by the Biotechnology and Biological Sciences Research Council (BBSRC), European Research Council (ERC) and Alzheimer's Research UK. 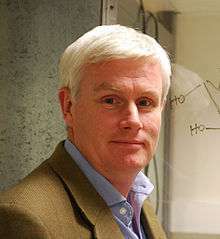 Davies was elected a member of the European Molecular Biology Organization (EMBO) in 2010, is a Fellow of the Royal Society of Chemistry (FRSC) and was awarded a Doctor of Science (DSc) degree from the University of Bristol in 2007. Davies married Valérie Marie-Andrée Ducros in 1999 and has two daughters. 1 2 Vocadlo, D. J.; Davies, G. J.; Laine, R; Withers, S. G. (2001). "Catalysis by hen egg-white lysozyme proceeds via a covalent intermediate". Nature. 412 (6849): 835–8. doi:10.1038/35090602. PMID 11518970. ↑ Gloster, T. M.; Davies, G. J. (2010). "Glycosidase inhibition: Assessing mimicry of the transition state". Organic & Biomolecular Chemistry. 8 (2): 305–320. doi:10.1039/B915870G. ↑ Gloster, Tracey Maureen (2005). Transition state mimicry in glycoside hydrolysis (PhD thesis). University of York. ↑ He, Yuan (2011). Mechanism and inhibition of a bacterial O-GlcNAcase (PhD thesis). University of York. 1 2 "Professor Gideon John Davies FRS". London: The Royal Society. Archived from the original on 2014-10-17. 1 2 Davies, Gideon John (2007). Published work submitted for the degree of D.Sc. (DSc thesis). University of Bristol. ↑ Davies, Gideon John (1990). Phosphoglycerate kinase from Bacillus stearothermophilus (PhD thesis). University of Bristol. ↑ Henrissat, B.; Davies, G. (1997). "Structural and sequence-based classification of glycoside hydrolases". Current Opinion in Structural Biology. 7 (5): 637–44. doi:10.1016/S0959-440X(97)80072-3. PMID 9345621. ↑ Davies, G.; Henrissat, B. (1995). "Structures and mechanisms of glycosyl hydrolases". Structure. 3 (9): 853–9. doi:10.1016/S0969-2126(01)00220-9. PMID 8535779. ↑ Agirre, Jon; Davies, Gideon; Wilson, Keith; Cowtan, Kevin. "Carbohydrate anomalies in the PDB". Nature Chemical Biology. 11 (5): 303–303. doi:10.1038/nchembio.1798. ↑ Agirre, Jon; Iglesias-Fernández, Javier; Rovira, Carme; Davies, Gideon J; Wilson, Keith S; Cowtan, Kevin D. "Privateer: software for the conformational validation of carbohydrate structures". Nature Structural & Molecular Biology. 22 (11): 833–834. doi:10.1038/nsmb.3115. ↑ Vocadlo, D. J.; Davies, G. J.; Laine, R.; Withers, S. G. (2001-08-23). "Catalysis by hen egg-white lysozyme proceeds via a covalent intermediate". Nature. 412 (6849): 835–838. doi:10.1038/35090602. ISSN 0028-0836. PMID 11518970. ↑ Ducros, Valérie M.-A. ; Zechel, David L.; Murshudov, Garib N.; Gilbert, Harry J.; Szabó, Lóránd; Stoll, Dominik; Withers, Stephen G.; Davies, Gideon J. (2002-08-02). "Substrate distortion by a beta-mannanase: snapshots of the Michaelis and covalent-intermediate complexes suggest a B(2,5) conformation for the transition state". Angewandte Chemie International Edition in English. 41 (15): 2824–2827. doi:10.1002/1521-3773(20020802)41:15<2824::AID-ANIE2824>3.0.CO;2-G. ISSN 1433-7851. PMID 12203498. ↑ Coutinho, Pedro M.; Deleury, Emeline; Davies, Gideon J.; Henrissat, Bernard (2003-04-25). "An evolving hierarchical family classification for glycosyltransferases". Journal of Molecular Biology. 328 (2): 307–317. doi:10.1016/s0022-2836(03)00307-3. ISSN 0022-2836. PMID 12691742. ↑ Yuzwa, Scott A; Macauley, Matthew S; Heinonen, Julia E; Shan, Xiaoyang; Dennis, Rebecca J; He, Yuan; Whitworth, Garrett E; Stubbs, Keith A; McEachern, Ernest J. "A potent mechanism-inspired O-GlcNAcase inhibitor that blocks phosphorylation of tau in vivo". Nature Chemical Biology. 4 (8): 483–490. doi:10.1038/nchembio.96. ↑ Wu, Liang; Viola, Cristina M; Brzozowski, Andrzej M; Davies, Gideon J. "Structural characterization of human heparanase reveals insights into substrate recognition". Nature Structural & Molecular Biology. 22 (12): 1016–1022. doi:10.1038/nsmb.3136. ↑ Yin, DeLu (Tyler); Urresti, Saioa; Lafond, Mickael; Johnston, Esther M.; Derikvand, Fatemeh; Ciano, Luisa; Berrin, Jean-Guy; Henrissat, Bernard; Walton, Paul H. (2015-12-18). "Structure-function characterization reveals new catalytic diversity in the galactose oxidase and glyoxal oxidase family". Nature Communications. 6: 10197. doi:10.1038/ncomms10197. PMC 4703870 . PMID 26680532. ↑ Quinlan, R. Jason; Sweeney, Matt D.; Leggio, Leila Lo; Otten, Harm; Poulsen, Jens-Christian N.; Johansen, Katja Salomon; Krogh, Kristian B. R. M.; Jørgensen, Christian Isak; Tovborg, Morten (2011-09-13). "Insights into the oxidative degradation of cellulose by a copper metalloenzyme that exploits biomass components". Proceedings of the National Academy of Sciences. 108 (37): 15079–15084. doi:10.1073/pnas.1105776108. ISSN 0027-8424. PMC 3174640 . PMID 21876164. ↑ Frandsen, Kristian E H; Simmons, Thomas J; Dupree, Paul; Poulsen, Jens-Christian N; Hemsworth, Glyn R; Ciano, Luisa; Johnston, Esther M; Tovborg, Morten; Johansen, Katja S. "The molecular basis of polysaccharide cleavage by lytic polysaccharide monooxygenases". Nature Chemical Biology. doi:10.1038/nchembio.2029. ↑ Larsbrink, Johan; Rogers, Theresa E.; Hemsworth, Glyn R.; McKee, Lauren S.; Tauzin, Alexandra S.; Spadiut, Oliver; Klinter, Stefan; Pudlo, Nicholas A.; Urs, Karthik. "A discrete genetic locus confers xyloglucan metabolism in select human gut Bacteroidetes". Nature. 506 (7489): 498–502. doi:10.1038/nature12907. PMC 4282169 . PMID 24463512. ↑ Cuskin, Fiona; Lowe, Elisabeth C.; Temple, Max J.; Zhu, Yanping; Cameron, Elizabeth A.; Pudlo, Nicholas A.; Porter, Nathan T.; Urs, Karthik; Thompson, Andrew J. "Human gut Bacteroidetes can utilize yeast mannan through a selfish mechanism". Nature. 517 (7533): 165–169. doi:10.1038/nature13995. ↑ "Professor Gideon Davies FRS FMedSci". London: The Academy of Medical Sciences. Archived from the original on 2014-10-25. ↑ Ducros, V. R.; Brzozowski, A. M.; Wilson, K. S.; Brown, S. H.; Østergaard, P.; Schneider, P.; Yaver, D. S.; Pedersen, A. H.; Davies, G. J. (1998). "Crystal structure of the type-2 Cu depleted laccase from Coprinus dnereus at 2.2 Å resolution". Nature Structural Biology. 5 (4): 310–316. doi:10.1038/nsb0498-310.